AUA LL.M. Students Participate in International Rounds of Jessup Competition in Washington D.C.
WASHINGTON D.C., US ‒ From April 1 to 7, 2018, the American University of Armenia (AUA) LL.M. Jessup Moot Court Competition team participated in the International Rounds of the 2018 Philip C. Jessup International Law Moot Court Competition held in Washington D.C. 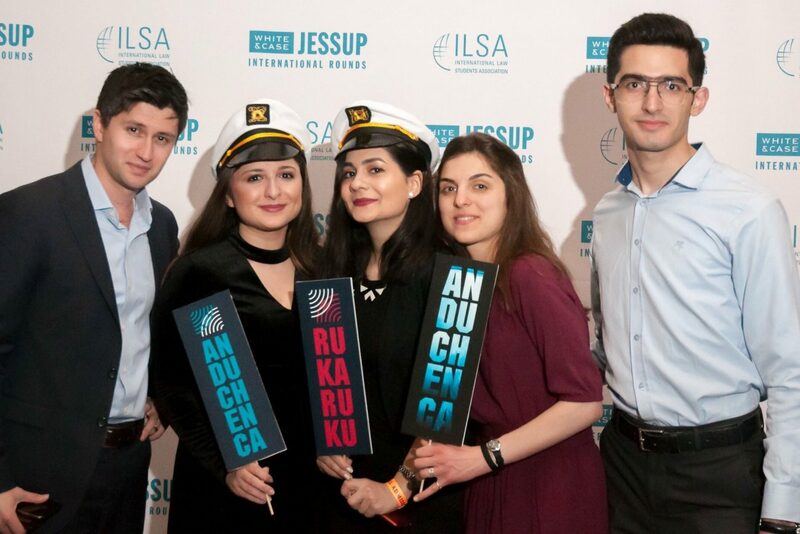 The AUA team became Armenia’s representative in the Jessup Competition after winning the national Qualifying Rounds held earlier in February. This year the contestants tried to solve a complex legal problem, which included issues of validity of interstate arbitral awards, the capture of an underwater vessel, the potential violation of nuclear disarmament obligations, and the conduct of states involved in naval warfare. The AUA LL.M. team was composed of Andrea Kajakdjian (LL.M. ’19), Ejmin Shahbazian (LL.M. ’18), Mariam Ghazaryan (LL.M. ’19), Monika Pirinyan (LL.M. ’19), and Mikayel Arzumanyan (BAB ’17, LL.M. ’19). Regretfully, due to unforeseen circumstances, Shahbazian could not join the team during the International Rounds. This competition has always been one of the most important global events for law students. It presents students with challenging legal issues both on substantive and procedural law. It is very demanding in terms of legal skills, such as legal writing, argumentation, research, and public speaking. Participation in this Moot Court gave the team an excellent opportunity to conduct a thorough research on legal issues, hone their skills in writing and presenting their legal work, rise to a higher level of professionalism, as well as build up their network with students and judges from more than 120 countries. “Jessup was an excellent opportunity, which helped us learn the theory and substance of public international law, trial advocacy, litigation. It helped us understand the value of substantive argumentation and correct application of law to facts. We believe that this would be an accelerating experience for our future careers,” noted the AUA LL.M. team members. They also highlighted the enormous work of the team Coach Levon Gevrogyan who helped them shape their way to the International Rounds of the competition. The AUA LL.M. program extends its heartfelt gratitude to Tavitian Foundation. As one of the flagships of support for cutting-edge education, Tavitian Foundation’s funding made the LL.M. students’ travel and participation in the International Rounds of the competition possible. The team has come back determined to win the competition next time!